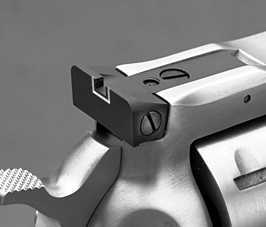 Bowen Classic Arms adjustable rear sights are dedicated designs engineered specifically for Ruger revolvers. Made from heat-treated alloy steel, these sights are finely machined from bar stock and matte black finished to reduce glare. Complete installation instructions included. These heavy-duty sights utilize tough, opposing-tension screws for adjustments rather than the target-type click movements but are still capable of precise adjustment. Butressed sight body and a substantial blade tenon afford increased protection for the sight blade. 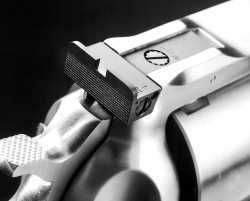 Sight blades are easily interchanged without removing the sight from the gun. 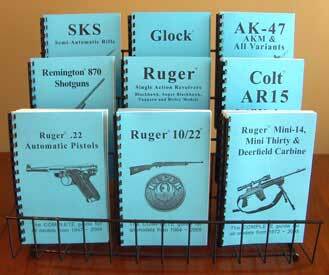 Available only for New Model Rugers using the standard .350 rear sight. Some Redhawks, Super Redhawks and GP-100 are fitted with the .390 factory rear sight and will need shorter front sights (available). Rough Country sight with square-notch/white-outline blade. - Standard .125 wide notch. sight blank blade (only) ( -$55.00 ) Sight v-notch/white-post sight blade (only) ( -$50.00 ) Sight with blank sight blade ( -$5.00 ) Sight with square-notch/white-outline blade. Sight with square-notch/white-outline blade. ( -$50.00 ) Sight with v-notch/white-post sight blade.